Audience research conducted by English Heritage in the last few years shows that many members of the public – even those who visit museums and galleries regularly – are not really that aware of the Battle of Waterloo, the forces who fought in it or the historical context in which the battle sat. But the implications of that one battle on the future of Britain and Europe were huge – indeed, it’s been argued that European history wouldn’t have been the same if it wasn’t for the outcome of that conflict in 1815. 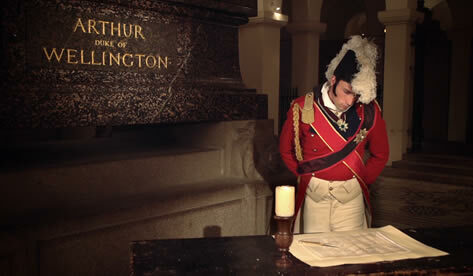 Key to the story from the British side was Arthur Wellesley, better known as the Duke of Wellington. Using his personal story as a catalyst English Heritage decided to redevelop the visitor offer at three of its sites linked to the man – Apsley House and Wellington Arch in London and Walmer Castle, in Kent. ATS Heritage were invited to assist English Heritage with the reinterpretation of these properties and our resulting suites of multimedia guides at Apsley House and Walmer Castle are installed and ready for the public to use. We had to think carefully about both of these projects, matching up English Heritage’s objectives for what they wanted visitors to experience as part of their visit and of a handheld multimedia experience, along with the technical issues of working in hugely important heritage spaces. At ATS we pride ourselves on using specific and appropriate storytelling techniques for different audiences and historic environments. At Apsley House we help visitors to identify and recognise what they are looking at in each room, but also to understand more about the figure of the Duke of Wellington who lived and worked there. The idea is that visitors are able to understand Apsley House as a home, not as a museum. Apsley is more than just bricks and mortar though. English Heritage’s collection of artworks, furniture and interior decorations are of world-class importance and the guide draws visitors’ attention to these too. Meanwhile in the quieter, coastal setting of Walmer Castle we told a more reflective story, explaining to visitors the life and legacy of Wellington in the place where he died. Using first-person accounts, quotations, archival imagery and recorded oral history. Overall it’s a more personal tour, aimed at getting visitors to connect with people, rather than just with bombastic castle architecture. ATS often has to consider how to tell stories to visitors at sites with multiple layers of history and Walmer was no exception. In this instance, family visitors are taken back into various historical periods by a time-travelling character who uses puzzles and quizzes to collect objects on the tour and build up a fuller picture of the castle’s structure and history. Both these tours – with options for adults, families, visually impaired visitors and those with first languages other than English – tell stories specific to the sites visitors are in. We don’t create content that could be written in a book or shown on television. We pride ourselves on standing in the shoes of a visitor, often making repeat site visits to truly understand a property, considering what people need to know and using out storytelling expertise to communicate with them directly. We think we’ve created a range of content that targets specific stories at specific audiences in specific historical spaces.